Cambridgeshire County Council is leading a project to roll out superfast broadband services across the county. It claims that 98% of homes and businesses in Cambridgeshire and Peterborough will have access to fibre-based broadband by 2015, with at least 90% of premises being able to access superfast speeds of at least 24 Mbps. The project currently appears to be well on track in terms of homes passed, although Openreach has been failing to keep up with high demand in some villages causing orders to be stopped and take-up to be artificially constrained. In September 2013, Connecting Cambridgeshire released an area checker, providing the latest estimated dates when each area is expected to receive fibre broadband. Click here to check your area on the Connecting Cambridgeshire site. You can also check availability on the BT Openreach checker too, as there can be differences in dates. Please be aware that both sites do not necessarily contain the very latest information. Just enter your phone number, although results will not be provided if you use Local Loop Unbunded services (e.g. from TalkTalk). In this case, use the Address Checker (and not the Postcode Checker) and enter your postcode and then select your address. What if fibre broadband is now available? What if fibre broadband is not yet available? Keep checking back, as fibre broadband will be available to 98% of premises by the end of 2015. For those waiting for fibre broadband, there are many way to improve your existing broadband connection as detailed in our Increase Broadband Speed Guide. Wiring improvements and a filtered faceplate could substantially increase your broadband speeds. Increasing the availability of fibre broadband is pointless if consumers and businesses do not take advantage of such services. Despite the increasing availability of fibre broadband (helped by BDUK-funded projects such as Connecting Cambridgeshire), take-up nationally of services on BT's fibre broadband network is still relatively low (about 14%). In sharp contrast with the national trends, some Cambridgeshire villages have experienced rapid take-up of fibre broadband, due in major part to the actions of proactive Broadband Champions. These have already proved that it is possible to achieve take-up well above the national penetration of fibre services within a few weeks through extensive awareness enhancement activities. If such high levels of take-up could be replicated across the county, Openreach would actually pay back some of the money invested by Cambridgeshire County Council, which could be used for other much-needed services. Grafham was the first village to benefit from superfast broadband as part of the Connecting Cambridgeshire project, with services launched in November 2013. Within two months of fibre broadband becoming available, there had been 87 fibre broadband orders/installations, representing nearly a third (32.7%) of properties in the village. Six months after fibre broadband had first become available, there had been 150 fibre broadband orders/installations - representing 56.4% of premises. Sadly, BT Openreach failed to respond to the rapid demand in Grafham quickly enough causing orders to be stopped in July 2014. 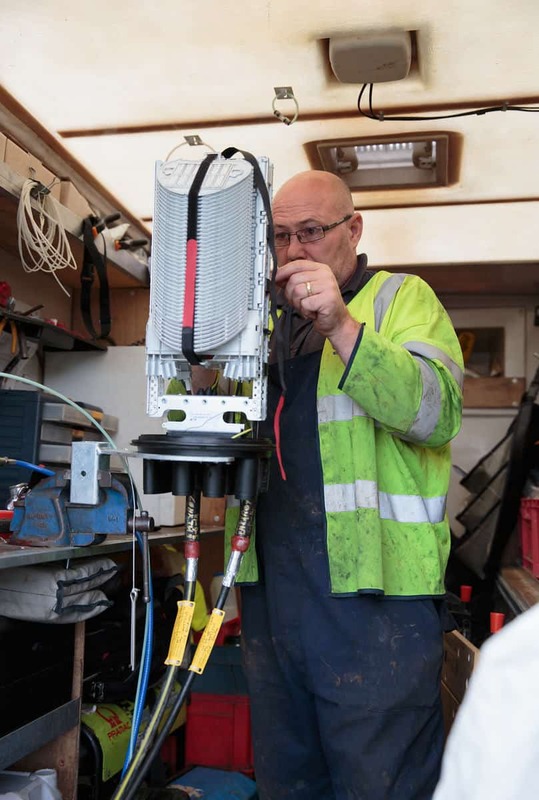 The first installations of fibre broadband in the village of Spaldwick took place on the 1st July 2014, as part of Connecting Cambridgeshire roll-out programme. Within only four weeks, 40% of households in the village had subscribed to fibre broadband! As with Grafham, Openreach failed to respond to the rapid demand, causing orders to be ceased after one month. Spaldwick is currently waiting for additional capacity to be added. The Connecting Cambridgeshire project is a large engineering project, involving many different activities, including the installation of many new fibre broadband cabinets and the laying of large lengths of cable across the county. Many Openreach engineers and contractors have been involved, from across the country. Even after fibre cabinets go live, many engineers are involved in customer installations. These demonstrate the huge breadth of activities involved in bringing fibre broadband to 98% of premises by the end of 2015. We were fortunate to witness the very first customer connection associated with the Connecting Cambridgeshire project! Please watch our video, below, which shows what is involved in a fibre broadband installation. Also, the video provides comprehensive 'before and after' performance comparisons, including online speed tests, Sky 'On Demand' and Apple TV streaming. Thanks to Alastair Brydon for his help in producing the video, and to Ben Williams from BT Openreach for being so understanding. For those lucky enough to be able to order fibre broadband already, we have produced our new article What's involved in a fibre broadband customer installation? While the media organisations tended to focus on the VIPs in attendance - including the local MP Jonathan Djanogly and BT NGA Managing Director Bill Murphy - fibre broadband is all about local communities. The stars of the show were the Broadband Champions who did such a magnificent job of raising awareness about fibre broadband in their local community. The video below shows the installation of a new fibre cabinet in the small Cambridgeshire village of Easton. 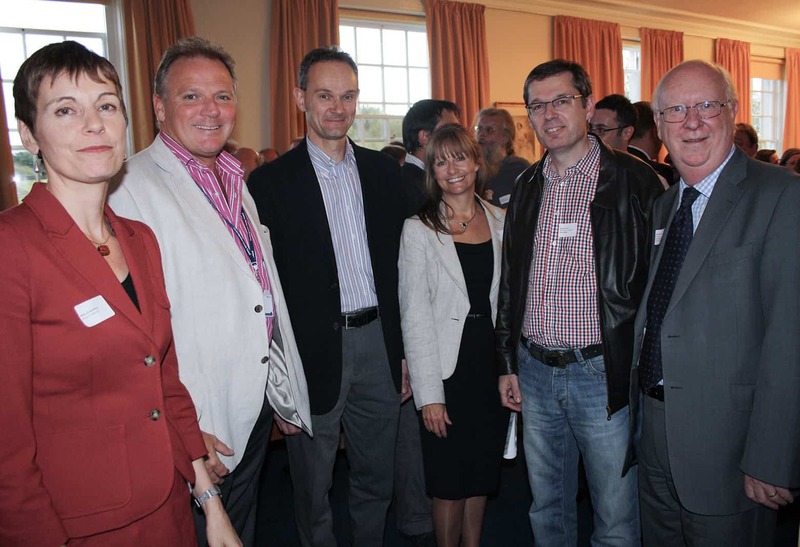 Connecting Cambridgeshire launched a registration scheme through which consumers and businesses could register their interest in superfast broadband. About 100 volunteer 'Broadband Champions' from across the county came forward to support the scheme. By January 2013, 24,000 homes and businesses had registered. This was one of the highest registration total on the country. Prior to the Government superfast broadband initiative, BT had planned a £2.5bn investment to roll out fibre broadband infrastructure to two-thirds of UK premises by 2014. The UK Government wants Britain to have the best superfast broadband network in Europe. A £530 million fund was identified for the Spending Review Period (to 2015), to be used to incentivise the roll out of superfast broadband into areas that the private sector would not reach under standard market conditions. This fund is being managed by a team within Department for Culture, Media and Sport known as Broadband Delivery UK (BDUK). Cambridgeshire County Council announced plans for investment in superfast broadband across Cambridgeshire. It initially targeted superfast broadband to at least 90% of premises across Cambridgeshire by 2015. Alongside £6.75 million Broadband Delivery UK funding, Cambridgeshire County Council agreed at a cabinet meeting on August 15th 2011 to invest up to £20 million to enable the roll-out of superfast broadband into areas within Cambridgeshire not covered by BT superfast broadband investment plans. On 4th February 2013, Cambridgeshire County Council announced that BT has been chosen as the winning bidder to roll out better broadband over the next three years. The contract was signed on Friday 8th March 2013. According to the Council, 98% of homes and businesses in Cambridgeshire and Peterborough will have access to fibre-based broadband by 2015, with at least 90% of premises being able to access superfast speeds of at least 24 Mbps. Consumers and businesses will have the choice of both Fibre to the Cabinet (FTTC) and Fibre to the Premises (FTTP) services. These are explained in our What is fibre broadband? FTTC and FTTP explained page. As detailed in our Increase Broadband Speed Guide, existing broadband speeds can be improved substantially for many people through the use of filtered faceplates, robust modems, newer ADSL2+ technology and proper choice of ISP. Additionally, ADSL lines can be cost-effectively bonded together to increase performance and resilience.